Globally, breast cancer is the most commonly diagnosed cancer in women. The National Cancer Institute projects approximately 253,000 new cases of women’s breast cancer in 2017, which represents 15% of all new cancer cases for the year1. Early diagnoses of these diseases can help in effective treatment. To promote early detection, the American Cancer Society recommends women begin considering annual mammograms at age 40, undergo annual mammograms between age 45 and 55, and continue annual or biennial scans thereafter2. With an estimated 80.5 million women aged 40 or older3 and an increased focus on preventive health care in recent years, healthcare providers are responding by developing imaging departments to meet current and projected demand for early diagnosis through women’s imaging centers. The four main women’s imaging modalities are mammography scans, bone density scans, breast biopsies, and ultrasound scans. Mammography scans use x-rays to scan breasts for tumors or calcium deposits and is done either as a routine screening or as a more in-depth diagnostic scan to investigate any irregularities previously discovered. Bone density (DEXA) scans also utilize x-rays to analyze bone density and measure any bone loss. Breast biopsies involve the sampling and testing of irregular tissue discovered through ultrasound or mammography for cancerous cells. Finally, ultrasound scans may also be used to examine irregularities discovered in a mammogram, specifically to determine whether the irregularity is fluid-filled or solid. Revenue drivers for women’s imaging departments include volume, reimbursement rates, and modality mix. Based on VMG Health’s database of women’s imaging departments, which includes both hospital outpatient departments and freestanding centers, average reimbursement per scan by modality ranges from a low of approximately $140 per bone density scan to a high of approximately $1,100 per breast biopsy. Average reimbursement per scan for mammography scans was approximately $170 and ultrasound scans was approximately $160. Although benchmarking average reimbursement can serve as a useful comparison, it is important to consider the marketplace and whether a specific department is freestanding or a hospital department. With regard to reimbursement trends, Centers for Medicare and Medicaid Services (CMS) granted a slight increase in 2017 for mammography scans. In addition, CMS recently decided against a ruling update that would have yielded a 50 percent cut in 2017 payment rates. CMS noted in the final rule that it intends to revisit this issue in 2018. 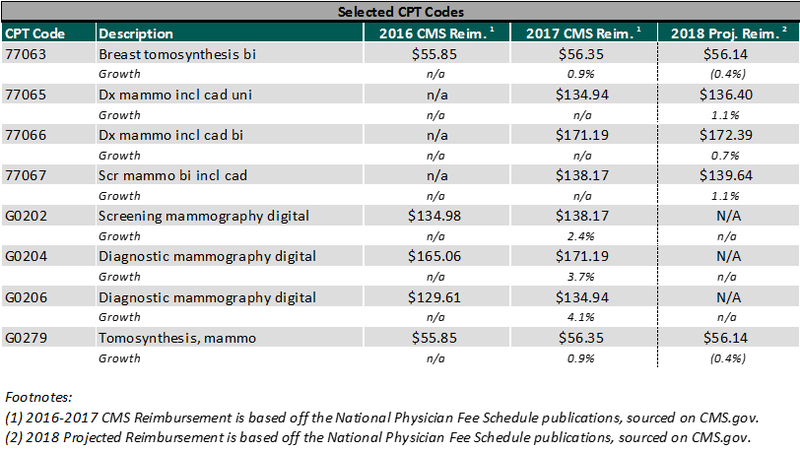 The chart below summarizes the reimbursement trends for the top mammography codes in 2016, 2017, and projected 2018. One important metric that women’s care providers track is the call-back rate, which is the percentage of mammogram scans that result in a breast biopsy. While breast biopsies receive the highest reimbursement of women’s imaging modalities, it is an invasive procedure and call-backs due to false positives can significantly increase patient burden. A study published in the American Journal of Roentgenology in January 2017 concluded that call-back rates between 12% and 14% resulted in a statistically significant increase in cancer detection4, while the national call-back rate is currently around 10%5. Similar to non-specialized imaging centers, women’s imaging centers are fairly capital intensive facilities. In addition, the women’s imaging sector has to manage the constant technological advances in diagnostic equipment. The latest technology in relation to screening and diagnostic mammography scans is the 3-D tomosynthesis, which can cost between $200,000 and $500,000 per machine, depending on the age and condition of the machine. Technology with 3-D capabilities has been proven to make breast cancer easier to identify in dense breast tissue and make the screening process more comfortable. The use of new mammography technology, such as 3-D tomosynthesis, also increases reimbursement as an add-on to standard mammography CPT codes. With the increasing demand for women’s health services, healthcare providers have shifted their focus from hospital departments to freestanding women’s imaging clinics. These freestanding clinics offer state-of-the-art equipment, physicians that specialize in breast imaging, and focus on the individual care and comfort of the patients. In addition, most of the women’s imaging clinics claim to provide ease of access and a spa-like environment in an effort to reduce the level of stress associated with cancer screenings. The American College of Radiology (ACR) has even determined criteria that women’s imaging centers must meet in order to become a Breast Imaging Center of Excellence. 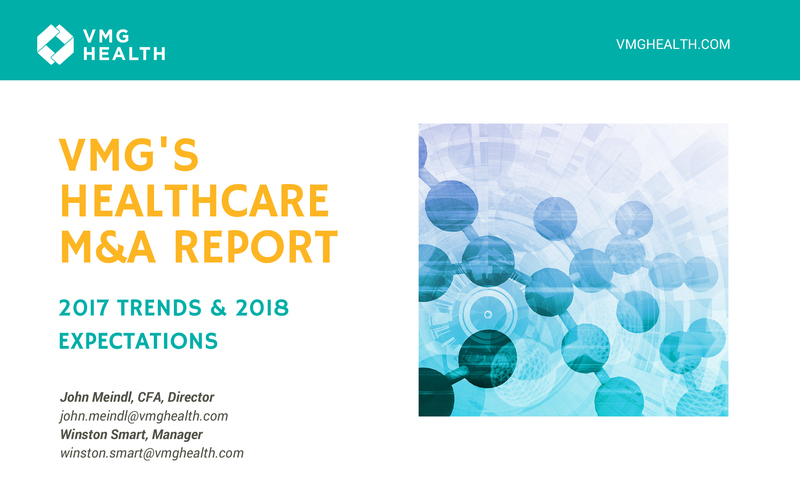 Leveraging VMG’s expertise as a leading provider of transaction healthcare valuation services, this annual report examines 2017 trends and 2018 expectations in key areas affecting M&A activity. 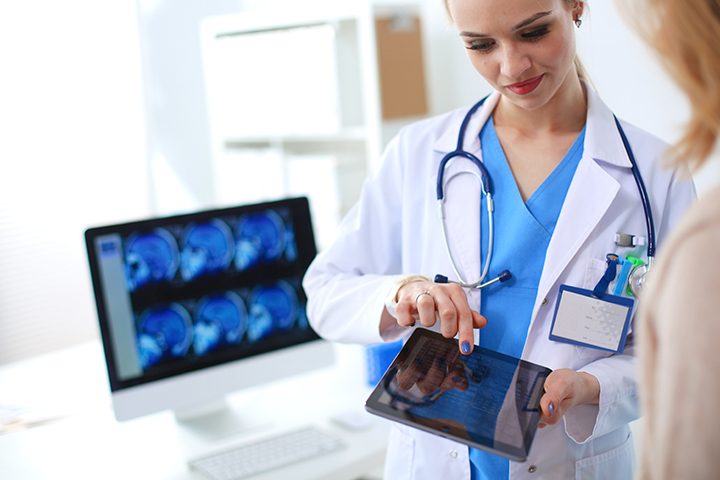 Take a look at the Diagnostic Imaging Center sector report.